I can't. I won't. It does no good. This is at least the sixth time I've posted this photo on my blog. 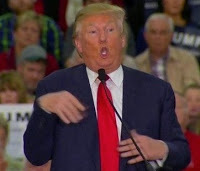 I have said over and over and over that I'm hurt and disgusted by the way this man mocked a disabled reporter at a rally. I've also said that Hillary Clinton is right -- anyone who applauds such behavior is indeed "deplorable." But that doesn't mean that the United States is filled with nearly 63,000,000 voters who think this was OK. They just didn't think it was disqualifying. Likewise, I don't believe that each of the nearly 63,000,000 voters who chose Trump over Clinton are misogynistic, racist and xenophobic. I can't believe that. I refuse to believe it. Latinos voted for Trump. Are they racist xenophobes? Women voted for Trump. Are they misogynists? Of course not. There has to be something else going on here. My doctor -- a smart woman -- believes many votes were swayed by "kitchen table issues," specifically an economy that has felt stagnant to many middle-class working whites. She doesn't think it's an accident that Obamacare and open enrollment took place concurrently with early voting. Joe Biden, certainly no racist/xenophobe, feels that the Democratic Party forgot middle-class working whites. I can see where they may have felt alienated and misunderstood by their choices on the blue side of the ballot: the establishment elite and the self-proclaimed socialist. I admit I was sorry that Hillary and Bernie were my only two choices. Though I found nothing disqualifying about either of them, and because I'm a party girl who believes the Democratic Party is about inclusion, I knew I would support whoever my party nominated. But neither of them stirred my soul and I really wished my party had a deeper bench. At any rate, I cannot get up each morning with the conviction that 63,000,000 of my fellow Americans are bad. It's not true. And besides, it does no good. We have to learn to talk to each other -- to listen to each other -- without judgement. We have to remember what Barack Obama said back in 2004, that what unites us is greater than what divides us. We have to figure out how to move forward in a productive way. So I'm sick of all the apocalyptic social media droning and whining. We don't have to have social unrest and riots. It is not our destiny. We can change it. By reaching out and trying to make things better. By trying to understand. For those of us in Illinois, the election of Donald Trump is very confusing. Two minutes after the polls closed, our state was called for Hillary Clinton. It wasn't even close. It never was. Yet all our neighbors went red this time. What's up with that? I had assumed it was because the Dems always have a good and dependable ground game. We all know when/where we can vote. We all know how to get a ride to the polls if we can't get there on our own. Also, Chicagoans of color are accustomed to making themselves heard at the ballot box -- especially this year, when police shootings have made Laquan McDonald and Paul O'Neal household names. But my friend Kathleen has an interesting theory: We voted Clinton because we know Bruce Rauner. A billionaire businessman,* Rauner ran in 2014 with the slogan: Bring Back Illinois. He claimed that with all the corruption and "business as usual" in Springfield, we needed to shake things up with an outsider. Does any of this sound familiar, America? Gov. Rauner is completing his second year in office, and so far, it's been a disaster. He simply cannot work with the State Legislature. Currently Illinois has no budget, in large part because Rauner has tied just about every line item to term limits. So because of his political fetish, our lottery winners aren't being paid, pensions aren't being funded and now homeless shelters will be closing. Rauner's approval rating hovers at 30%-35%. Bruce Rauner refused to speak Donald Trump's name during the run-up to the election, and I don't mean to link him to Trump's more incendiary and insensitive rhetoric. That wouldn't be fair. But Kathleen could be right: Perhaps our up-close and personal view of a successful businessman with no legislative experience could have made us less likely to take a chance on Trump. *Although Rauner actually is a billionaire. He was very open about his personal finances. I suspect Trump is worth considerably less than he wants us to believe.